Jeffrey Perkins is a visual artist and filmmaker who recently resurfaced at The Emily Harvey Foundation in Brain Damage on Broadway, an evening of hypnosis, experimentation and psychedelia organized by artist Taketo Shimada of Messages. Years ago Jeff co-founded Single Wing Turquoise Bird, who provided light shows to Velvet Underground, Grateful Dead and Dr. John to name a few and on October 25’ 07, through Shimada’s initiative, resurrected his first light show in thirty years to the sounds of Shimada’s own collaborative project Messages. 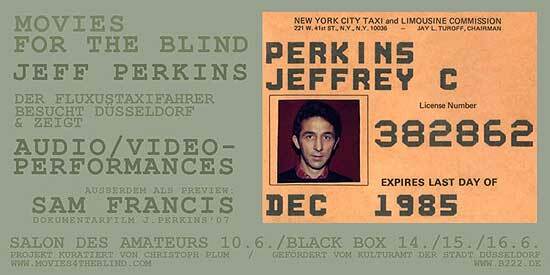 But there is far more to know about Perkins, a decades long associate of Yoko Ono, John Lennon, George Maciunas and Nam June Paik among many others. While serving in the U.S. Air Force stationed in Tokyo in the early 1960’s, he met Yoko Ono and her husband Anthony Cox. Through them he was exposed to the works of Cage, Duchamp, LaMonte Young and others and began participating in events, performances and concerts. Jeff currently exhibits at the Emily Harvey Gallery and is now finishing up his new film ‘The Painter Sam Francis’. The following interview took place on a day in December 2007 in Jeffrey Perkins’ loft, in New York. We had just seen his last documentary film The Painter Sam Francis. The catalogue of the Venice Biennial historic exhibition Ubi Fluxus Ibi Motus, of which he took part, was among his books, together with a program of the experimental Cinematheque Theater 16 that he directed in Hollywood, and his personal copy of the Fluxfax Portfolio. On the floor, two suitcases fostering hours of interviews with passengers Perkins used to record in his cab, following Nam June Paik’s advice. Jeffrey Perkins is the author of original performances, the discreet story teller of Sam Francis’ work, the friendly camera operator of Yoko Ono’s Film #4. Above all he is the witness of the fact that art is the place where the singularity of one’s own practice coexists with the sharing of ideas. Concepts that animate his practice are the source of his artistic and personal charm and one of the most interesting issues I really would like to deal with, in thinking and organizing art. Chiara Vecchiarelli (CV): I like the idea that the material was nothing but the medium for your practice …. Taketo Shimada is an artist organizer, visual artist and musician from Tokyo. He has lived and worked in NYC since the mid 80s. He has worked with a variety of figures such as Henry Flynt, Alison Knowles and Rammellzee to name a few. Tres Warren is an artist and musician living and working in New York City. He’s involved in various music collaborations including Messages and has performed as part of Damo Suzuki’s Network, in addition to recording and touring internationally with his band Psychic Ills. Messages – a duo comprising Tres Warren of Psychic Ills and visual artist Taketo Shimada. The Emily Harvey Foundation is a private foundation registered in the State of New York.